Check your outgoing mail queue. Usually this is the first sign that something is going on. If you have hundreds to hundreds of thousands of messages waiting to be sent, you have probably been compromised. By admin on March 12, 2014 | Spam | A comment? 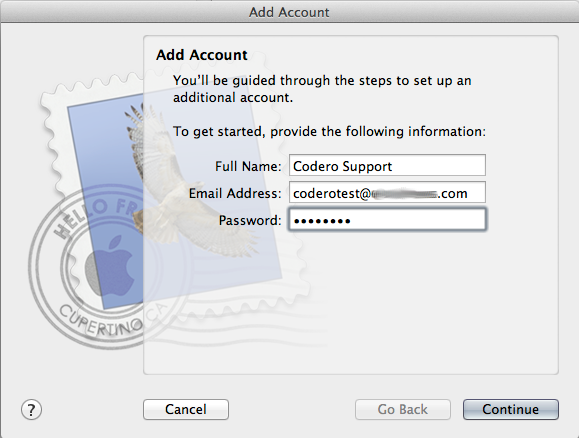 Password: Enter the user’s password that was setup when the account was created. Please note these two items! 1. You must use the FULL EMAIL ADDRESS of the user for the User Name. the system will default to just the username and does not automatically add the domain name. The domain name must be added for the account to work. 2. 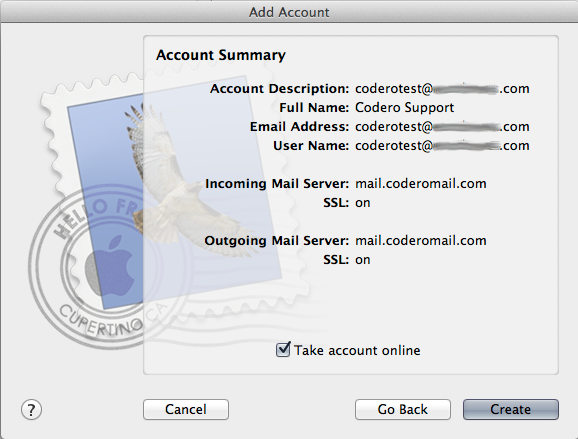 For the Incoming Mail Server, use mail.coderomail.com if you are going to use SSL. Failure to use mail.coderomail.com may cause your system to reject the ssl certificate. Description: This is optional, you may leave it blank. 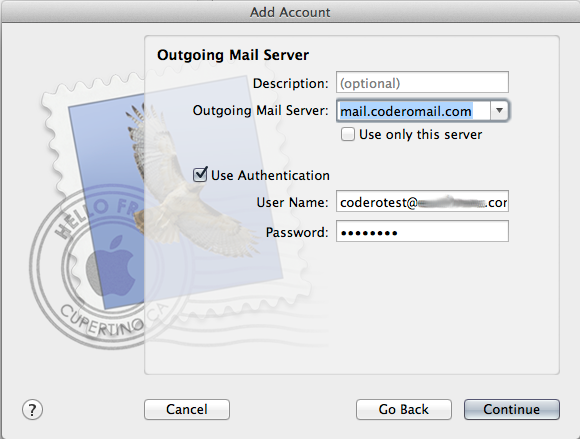 Outgoing Mail Server: Select mail.coderomail.com from the dropdown box. [ ] Use only this server: Leave this unchecked. [X] Use Authentication: Make sure this is checked. The Account Summary screen will show you the current settings for your new account. Click the Create button to complete the setup. 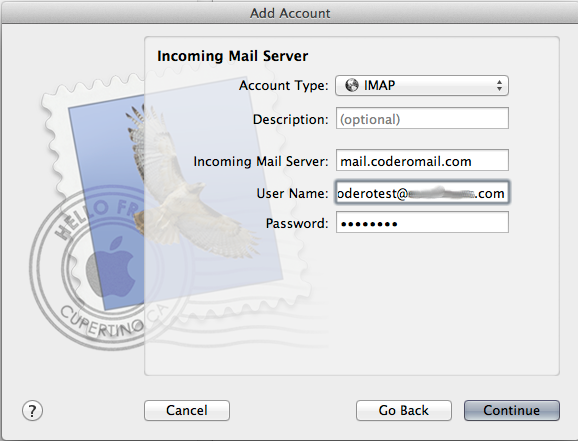 If you are experiencing issues receiving, you may need to check the port values for IMAP. Right click “Inbox” then select Edit “Domain” to open the Account Settings screen. Select the account by clicking the account name in the right hand column, then click the Account Information tab. Full Name: Set the name of the email user. This is usually the users first and last names. User Name: Enter the FULL email address for this account. Password: Set the password of the email account. 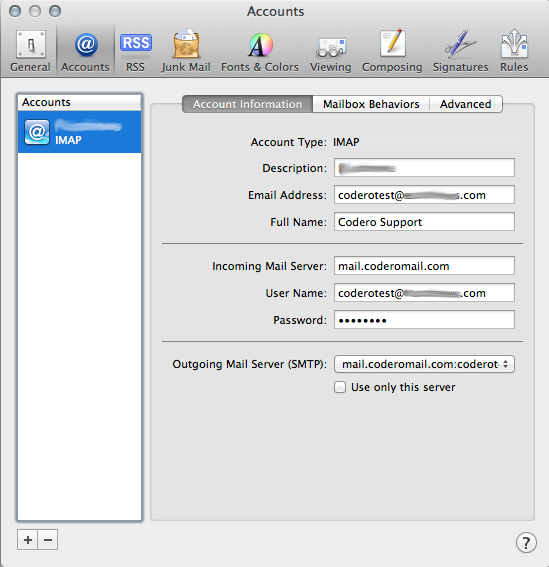 Outgoing Mail Server (SMTP): Select mail.coderomail.com. This sets the mail server this account will send through. [X] Include when automatically checking for new messages. This is optional but suggested. If this is not checked you will need to manually check for new messages. 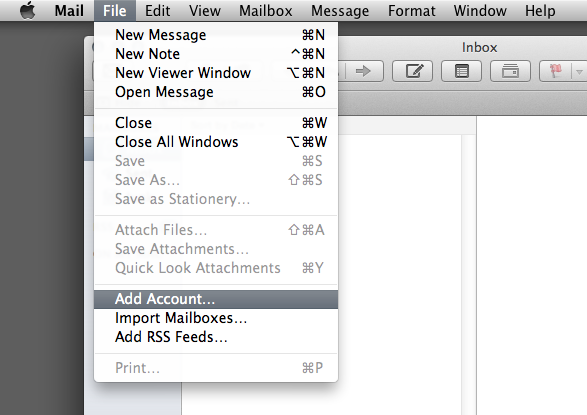 By admin on March 5, 2014 | Mac, Mac Mail | A comment?